THIS ITEM IS NOT AVAILABLE AT PRESENT. WE WILL NOT BE GETTING ANYMORE Star Wars Darth Vader Bulb Botz Watch. From the Star Wars collection by Schylling. 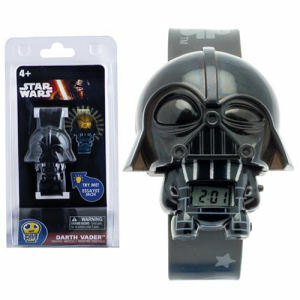 Star Wars Darth Vader Bulb Botz Watch. This watch features a backlit LCD screen with alarm settings. Watch strap measures about 8.75 inches long and measures 0.75-inches wide.